is to succeed in preparing, within the shortest times, texts which have to be perfect in any aspect. These texts can be produced following a fast dictation at progressive speed, or copying or editing from a basic text, as well as integrating data, images and texts coming from different sources. At each Congress, results are improving and they are the combined effect of perseverance, experience, technology and didactic improvements . 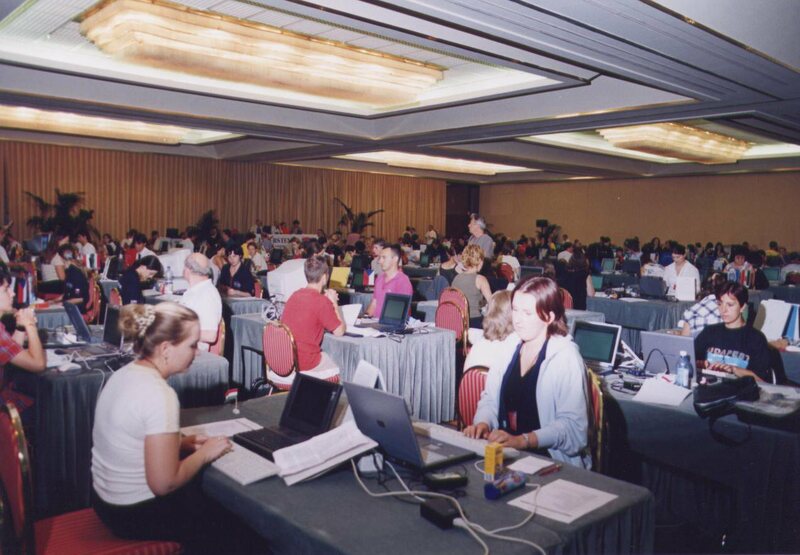 The big halls for keyboarding competition in Beijing 2009 and Roma 2003. The competitions follow two parallel streams: to take down a text read at an increasing speed or to enter texts and data processed with a computer. In either cases speed and accuracy are the factors of the success. The traditional tools (pen, paper, typewriter) are now coupled or replaced by computers, traditional or electronic stenotype machines, speech recognition softwares. These technical evolutions had to be considered in the rules of competition, which are constantly up-dated. Here is a synthesis of the actual formulas of competition, whose rules you can consult in the special menu on the left of this page. These rules had been once again up-dated during the last meeting of the Council. If you want to take part to our next championships, we beg you to consult the rules. Further information can be asked by email to our jury: jury@intersteno.org. Take and transcript a five-minute dictation at progressive speed. The competitor chooses the text to transcribe among three consecutive five-minute dictations given at speeds increased each minute. The initial and final speeds of each dictation are related to the language of the competitors, according to a comparison table set up by the Intersteno Council. At least the first three minutes of dictation must be transcribed successfully. Transcription will be handed out on pen-drive or with hand transcription by whom uses traditional shortand. Every kind of technology can be used (shorthand - stenomachines and computer keyboarding - voice recognition). Competitors using speech recognition must compulsory use stenomask or silencer. One classification list for each technology, but only 1 world champion, the one reaching the best result. The contest consists of 30-minute copying of printed text . Computer and stenotype keyboards can be used. Separate classification list is foreseen for competitors using speech recognition, who must use stenomask or silencer. - pupils (up to 15 years of age) 240 characters per minute. For each category, the maximum errors allowed is 0.25 %. Competitors must hand in their work on USB-sticks provided by the Jury. Take of an eight-minute dictation using any kind of technology. The transcription is delivered without any correction, at the end of the eight minutes, on a USB-Sticks delivered by the Jury. Transcription is valid if at least the first three minutes taken are successfully transcribed. Competitors who cannot follow the dictation must stop writing and no correction is allowed. If speech recognition is used, competitor is compelled to use a voice silencer (stenomask). Competitors receive a text on a pen-driv. They have to make modifications and corrections as shown on a printed sheet. The kinds of corrections will be indicated with international signs used by professionals in text correction. The competitors will enter as many as possible within a time frame of ten minutes. This competition consists of two parts. First, a verbatim transcription of a three-minute dictation of a letter introducing the theme of the second part. Second: a summary report (the minutes) in complete sentences from a text which will be dictated for seven minutes. The text of this latter dictation contains a title and several numbered paragraph titles which indicate the theme and subthemes of the text to be summarized. These titles have to be transcribed verbatim. The work must be completed within 120 minutes. The competitor receives, on a USB-stick, one or several texts in English as well as data and pictures. He will also receive several sheet with instructions written in his own languague. He has to prepare a professional document within 75 minutes. The competitors will mainly use a word-processing software. Competitors in the speech capturing competition may also take part in the multilingual competition. This competition involves taking down dictations in at least two foreign languages. These languages will be stated in advance on the registration form. Each dictation lasts three minutes, at the speeds of 120-130-140 syllables respectively for each minute. Languages available: English, French, German, Spanish, Portuguese, Finnish, Swedish, Czech, Slovakian, Russian, Bulgarian, Turkish, Dutch, Estonian. Competitors can be successful either in mother tongue plus one foreign language or in at least two foreign languages without taking part in the mother tongue competition.